A team of five firefighters from Tyne and Wear Fire and Rescue Service will be running the Great North Run in full kit on Sunday, 11 September in aid of the Firefighters Charity. 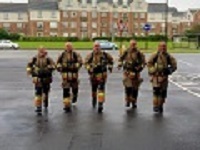 Iain Stewart, Natalie Mortimer, Angelano Quintano, Ritchie Biggs and Graham Smith are tackling the half marathon course wearing their firefighting kit, complete with breathing apparatus. They will attempt to complete the last mile ‘under air’ using the breathing sets. “The date of this year’s Great North Run is very poignant for firefighters, being the 15th anniversary of the attack on the two World Trade Centre buildings in 2001 where so many of our colleagues from the New York Fire Department lost their lives,” explained Smith. The Firefighters Charity enhances the quality of life for serving and retired firefighters, other fire service personnel and their families. It costs about £1,200 to provide a week’s rehabilitation programme for a member of the fire service community in their time of need. This service is available to everyone employed by the fire service, regardless of whether or not they support the charity. However, with no government funding, the charity is completely reliant on the generosity and enthusiasm of supporters – in time, money and energy.